I currently use a child-theme for this site1, its parent being twentysixteen. I keep modifying this theme on my local machine and push updates to my live site. But in parallel, I want to start building a completely new theme, based on the starting _s theme. I'm uncomfortable developing this new theme within the same local environment; I want, instead, to create a playground where I can experiment, knowing it's completely isolated from my production environment. With that goal in mind, I installed a second instance of WordPress on my local machine, and now I have 3 environments - production(that's where my live site reside), staging and development. 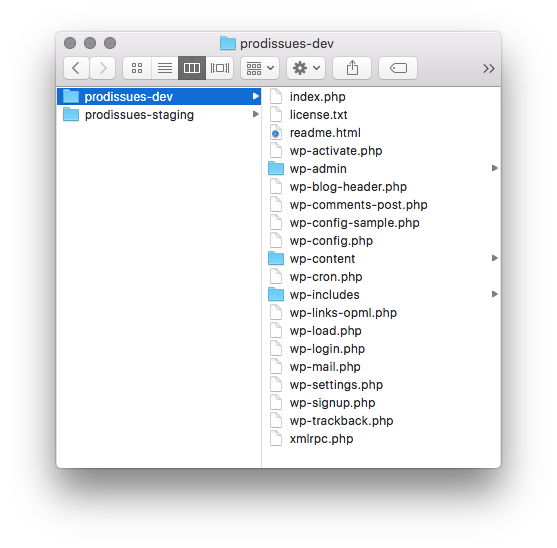 I moved the content of my original WordPress to the /prodissues-staging folder. I then had to go to MAMP and change the "Document Root" setting, to point to the new location, so that when I visit localhost:8888, I still land on my site. At that point I was ready to install WordPress in my development environment. This is the same process as installing WordPress for the first time, including the creation of a new database2. To refresh your memory on how to do it, here's WordPress "Famous 5-Minute Install" guide. I now had two WordPress installations on my local machine (and one hosted). 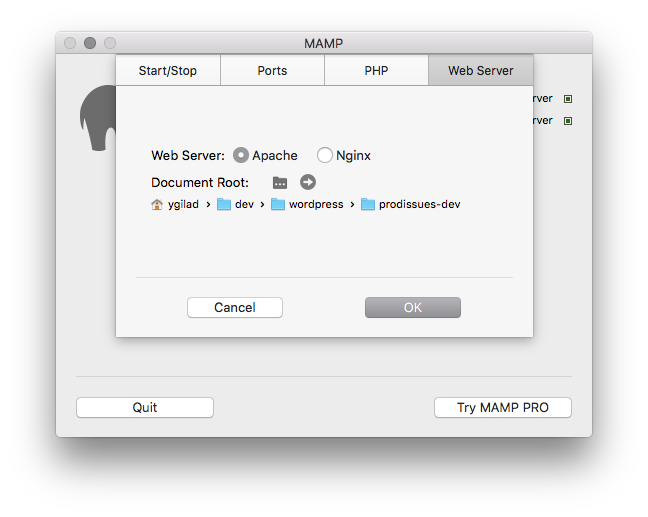 Switching from one to the other is as simple as changing the "Document Root" in MAMP, as was shown above. What left to be done is to define a workflow that will help me keeping the different environments fresh, while making sure the live site (i.e. production environment) is safe from what's going on in the development environment. My plan is to make sure that staging is always in sync with production. I'll build my new theme in the development environment, and push it to staging when it's ready. If everything works fine in staging (which is, again, almost identical to the live site) then I'll push the new theme to production. The most important resource that I would like to protect is the production database, since it holds the content of my blog. I might be missing something here, but I see no reason to ever override it with a version of the database from other environments. 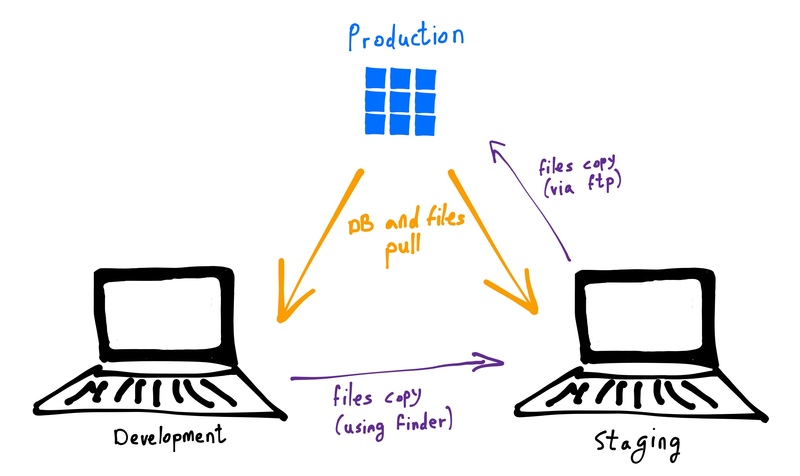 Therefore, the production database can only be pulled to the staging or development environments3. I shouldn't push files from development directly to production. I should move them instead to staging. This will protect my live site from un-tested or broken code. Staging is where new code is tested. From there it can be pushed only one way - to production via ftp. Again, there's no upload of the database to production. This one-way streets architecture should give me the peace of mind to build and breaking stuff, knowing that whatever I do won't affect the other 2 sane environments. Is there any reason that I haven't thought of to push database from staging to production?